One complication you may face in your attempt to create a hard copy is that AutoCAD 2014 has two distinct ways to communicate with printers and plotters. Operating systems, and the programs that run on them, use a special piece of software, the printer driver, to format data for printing and then send it to the printer or plotter. When you configure Windows to recognize a new printer connected to your computer or network, you’re installing the printer’s driver. AutoCAD, like other Windows programs, works with the printers you’ve configured in Windows. AutoCAD calls these system printers because they’re part of the Windows operating system. But AutoCAD, unlike other Windows programs, can’t leave well enough alone. Some output devices, especially some larger plotters, aren’t controlled efficiently by the Windows system printer drivers. For that reason, AutoCAD comes with specialized non-system drivers for plotters from companies such as Hewlett-Packard, Xerox, KIP, and Canon-Océ. These drivers ignore the tidy rules for communicating with Windows printers in order to get things done more accurately and more quickly. Most of the time, using already configured Windows system printers is easiest, and they work well with many devices, especially devices such as laser and inkjet printers that print on smaller paper. However, if you have a large-format plotter, you may be able to get faster plotting, better plot quality, or more plot features by installing a non-system driver. To find out more, search for your specific plotter using the AutoCAD online Help system. Launch AutoCAD and open an existing drawing or start a new, blank drawing. Choose Options on the Application Menu or type OP and press Enter to open the Options dialog box; then click the Plot and Publish tab. Click the drop-down arrow to view the list just below the Use as Default Output Device option. Windows: A little printer icon with a sheet of white paper coming out the top indicates a Windows system printer configuration. Non-system: A little plotter-with-legs icon with a piece of paper coming out the front indicates a non-system (that is, AutoCAD-specific) configuration. The non-system configuration names always end in .pc3 because they’re stored in special AutoCAD Plotter Configuration version 3 files. So, if you can’t distinguish the difference between the icons, look for the .pc3 at the end of the name. Verify that the list includes the printers and plotters you want to have available in AutoCAD. Windows XP: Choose Start→Printers and Faxes, and then click the Add a Printer link under Printer Tasks on the left side of the window. Windows Vista: Choose Start→Control Panel→Hardware and Sound→Printers→Add a Printer, and then click Add a Local Printer. 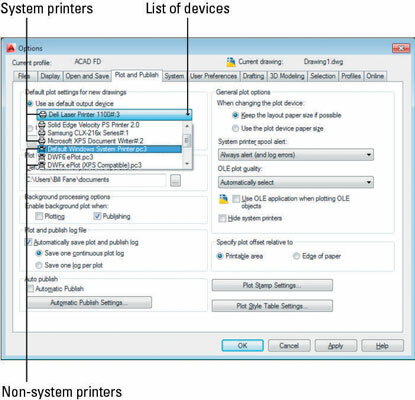 Windows 7: Choose Start→Devices and Printers→Add a Printer, and then click Add a Local Printer. Windows 8: Hold down the Windows key and then press W. In the Search field, enter printers. Under Settings, choose Add Printer. If your printer isn’t in the default Windows list, cancel the wizard and hunt down a driver disc that came with the printer. Better yet, download the current driver from the printer manufacturer’s website. Choose the output device that you want to designate as the default for new drawings. Click OK to close the dialog box and retain any changes you made in Step 5. You use the AutoCAD Plotter Manager’s Add-a-Plotter Wizard to create non-system driver configurations. (Choose Plotter Manager on the Plot panel of the Ribbon’s Output tab to display an Explorer window containing a shortcut to the wizard.) This wizard is similar to the Windows Add Printer Wizard; if you can handle adding an ordinary printer in Windows, you can probably handle adding a non-system plotter configuration to AutoCAD. When you complete the wizard’s steps, AutoCAD saves the information in a PC3 (Plotter Configuration version 3) file. If you add an HP Designjet printer or certain Canon-Océ wide-format printers, you’re advised by the Add-a-Plotter Wizard to exit and install the device as a Windows system printer instead. Many people find that the standard drivers work fine, but custom drivers may include additional paper sizes among other handy settings.